Today I am sharing the recipe of Aviyal or Avial.It is a dish that has a unique place in a typical Kerala Cuisine as well as in Tamil cuisine. It is a thick mixture of lots of vegetables, curd and coconut. 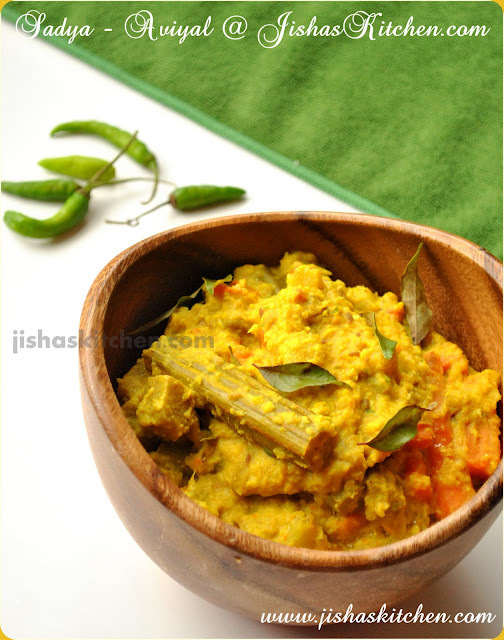 It is seasoned with coconut oil and curry leaves. Kerala Sadya (Feast) will not be considered complete without Aviyal. Vegetables commonly used in Aviyal are elephant yam, plantain, pumpkin, carrots, beans, brinjal etc.Some people prefer to substitute raw mango or tamarind pulp for the curd. This dish can be made into a gravy and eaten with rice or be made into a semi-solid side dish. The word "aviyal / avial" is also used to denote an assortment or a mixture. Aviyal is supposed to have been invented by Bhima (one of the Pandava brothers) during his Ajnanavasam. According to the legend, Bhima was the cook in the kitchen of Virata. But Bhima did not know how to cook. So one of the first things he did was to chop up many different vegetables, boil them together and top the dish with grated coconut. Dont worry if you don't have all the vegetables mentioned below with you. I personally feel Aviyal will be very tasty with just raw plantain, elephant yam, carrot, drumstick, beans etc. You can use vegetables depending on the availability, but please make sure not to use tomato, beetroot, okra etc. Aviyal is my husband's favourite dish, so I prepare this almost everyday. Coconut oil ~ 1 tbsp. First wash and chop vegetables to medium length pieces ( Note: Chopped pieces should resemble the shape of french fries). Then cook the vegetables except drumsticks by adding 1 cup of water for about 10 minutes in a medium flame and then add drumsticks, 1/2 tsp turmeric powder and salt and cook covered for another 5-10 minutes. Meanwhile grind coarsely grated coconut, cumin seeds, green chillies, shallots and 1/2 tsp turmeric powder and keep it aside. When the vegetables are cooked lower the flame and add curd / tamarind paste along with ground coconut paste and mix it nicely using the back side of a wooden spoon. Make sure not to mash the vegetables and then remove from the flame after 3-4 minutes. Then finally add curry leaves and coconut oil to the aviyal. 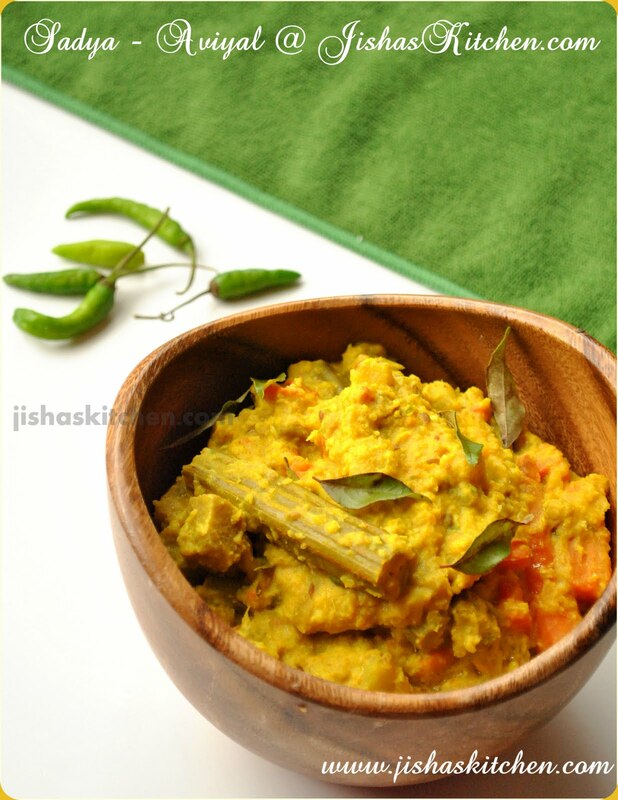 I am sure no other vegetable dish can compete with yummy avial! Perhaps the best of Kerala Sadya.You have presented it in a classic way Jisha..We don't use yam and brinjal like veggies in Avial though..
wow..yummmy..healthy aviyal,very nutritious for kids! Avial is my fav...i can go on eating aviyal.. ;-))..looks yummy and extremely delicious...nice clicks..story abt aviyal's origin is also good..
one of my absolute favs but havent had it for ages..m soo drooling looking at this now..
Adipoli aviyal..my favorite,looks superb dear. Wow.. looks so tempting and perfect.. amazing presentation dear..
Nice aviyal! It looks very lovely and tempting! Feel like finishing that wonderful bowl of tempting aviyal,inviting.. I love avial, cos of all the veggies that go into it!....too tempting! Avials are made on many festive occasions in Tamilnadu. I am sure this dish was influenced by Kerala cuisine. Yummy! Delicious dish, lovely bowl and excellent clicks.